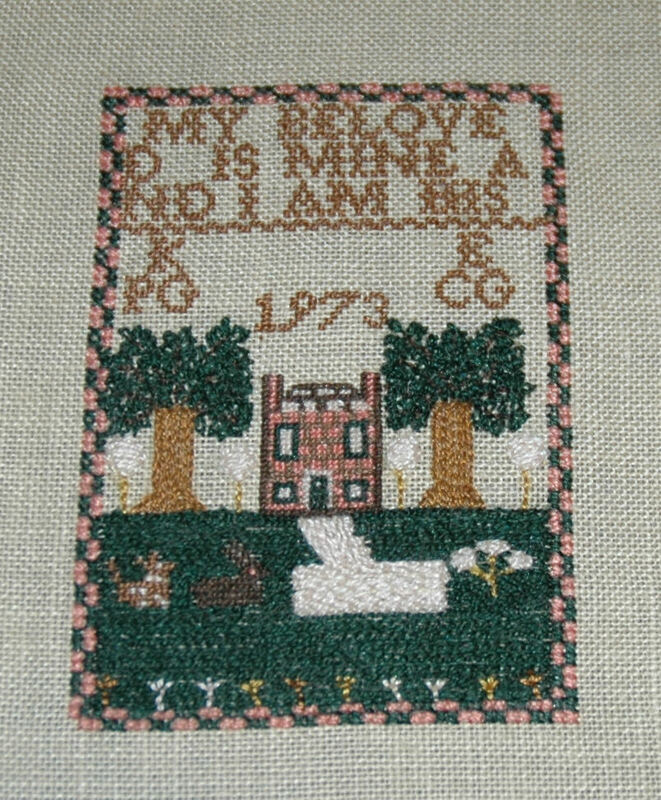 Bits of My Own: My Beloved is Finished! Harriot is next! I worked on it all last week and finally finished up on Saturday. 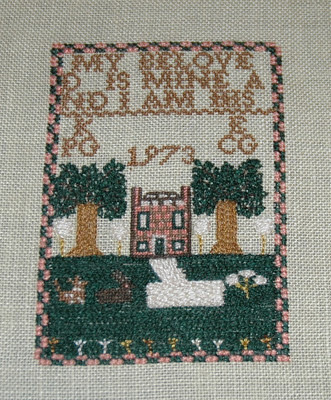 The part that took the longest of course was the green lawn background, which was filled in with a horizontal stem stitch. I love the little dog and bunny on the lawn! The white veranda is stitched in a horizontal and slanted satin stitch. The little flowers at the bottom were added after the lawn was completed. The whole thing measures 3-1/2" X 2-1/2". Here is the finished sampler. 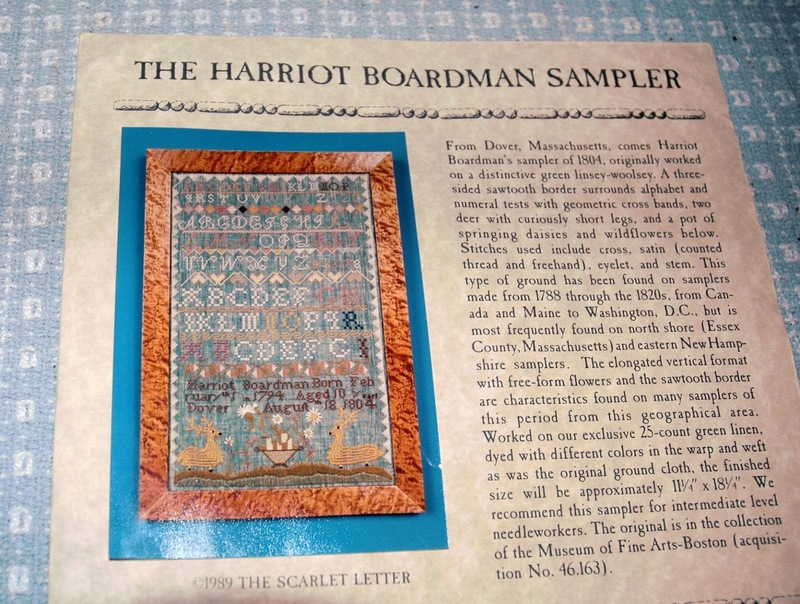 For my next project, I decided to take on The Harriot Boardman Sampler. I am using DMC, stitching on 25-count green linen. I must say I am intrigued with this linen. It is dyed with different colors in the warp and weft, as the original was. 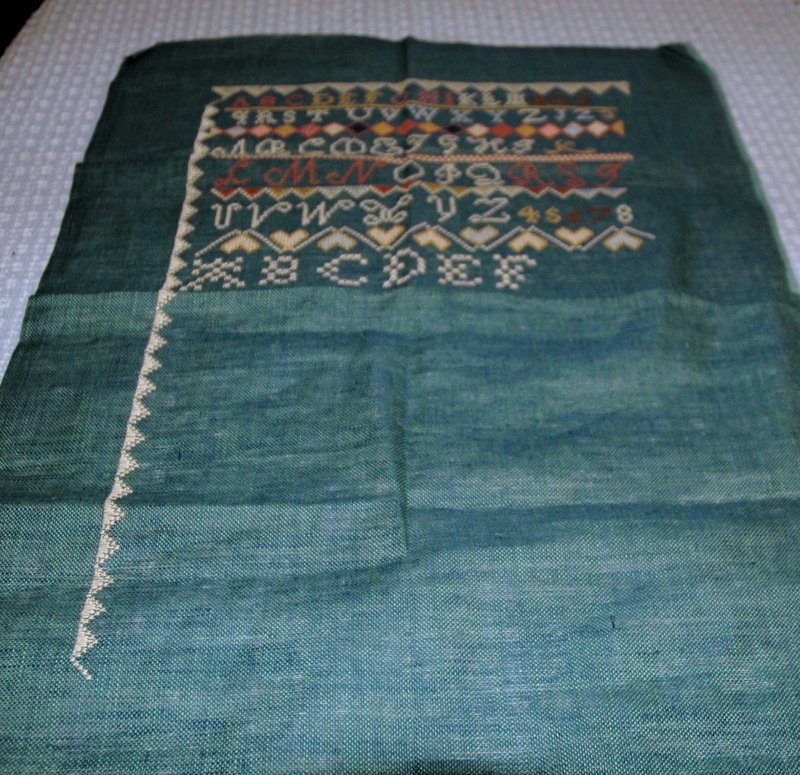 It is a unique combination of blue and green threads. 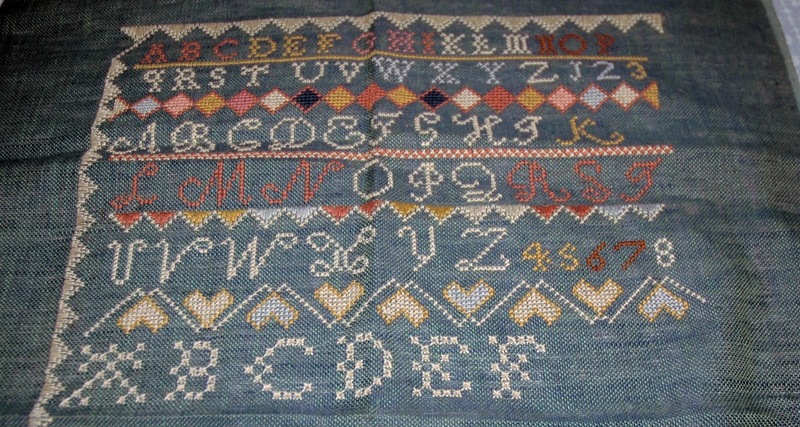 The sampler comes from Dover, Massachusetts. The stitches used include cross, satin, eyelet, stem, counted thread and freehand. 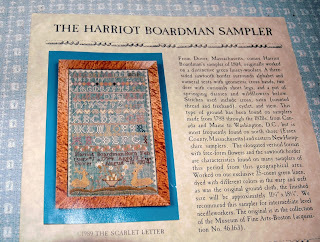 This type of ground has been found on samplers made from 1788 through the 1820's, from Canada and Maine to Washington D.C., but is most frequently found on samplers from the north shore, Essex County Massachusetts and eastern New Hampshire. The deer, flower pot, and grass at the bottom are all freehand. That should be interesting! Aww such a sweet finish,,well done dear.. 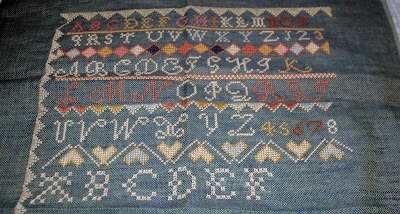 Your new sampler start is so lovely too..
Beautiful finish and such a pretty sampler. I love your finish! So cool!!! Your next start is wonderful too! Nice job, can't wait to see the finish on Harriot. I will be following Harriet with great interest. A great finish and your new project looks very interesting. I think it looks quite lovely. Wow, congratulations on the finish! You are whipping through those samplers, you go girl!! Congrats on the lovely finish! You made it! Lovely little finish! Great WIP, too. You're right, interesting piece of linen, and so pretty. Congratulations on finishing 'My Beloved', it's gorgeous. I feel your pain on the over one on 35 count, my oldest wip is that which is why it's my oldest! Congratulations on your finish! Beautiful WIP. Love the colors.